Chatham County Police are searching for a suspect wanted in connection with a shooting that happened at a residence this morning. 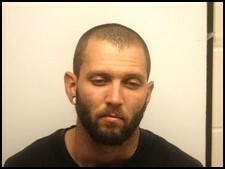 Detectives are searching for 28-year-old Josef Craig Odum. "Odum is accused of shooting a husband and wife at a home in the 100 block of Gunpowder Drive around 9:00 this morning. Police say Odum knew the victims, and believe the shooting was the result of an ongoing disagreement," [police report. Anyone with information regarding Odum’s whereabouts should call 911. When police arrived at the scene, "they found a male victim with multiple gunshot wounds and a female victim with superficial wounds. Both were transported to the hospital," police say. Police believed the suspect was inside a residence on Gunpowder Drive. After being unable to make contact or confirm whether the suspect was inside, Chatham County Police asked for the assistance of the Savannah Police Department SWAT team and Hostage Negotiation Team. "After a thorough search of the house, it was determined that the suspect was not inside the residence. The Chatham County Mosquito Control helicopter also searched the area by air," police say. While police do not believe Odum poses a danger to the public at large, the Board of Education Police Department was notified and schools in the area were put on lockdown as a precaution.